When did you first discover Saint Lucia? In 1989, I hopped on a plane from London with twelve friends and came to vacation on the island for two weeks. 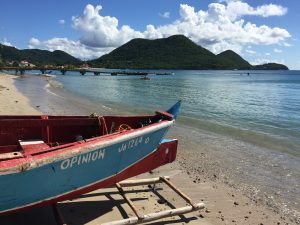 We stayed at Halcyon Beach Club, I instantly fell in love with Saint Lucia and came back four times in the following three years. And when did you move here permanently? Just before Carnival in February 1993, after I took voluntary redundancy from my IT job in the UK. 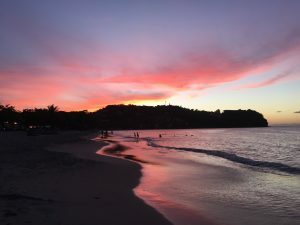 I planned to stay for six months, but that turned into twenty-six years (so far) when I married a Saint Lucian, had two children and a globe-trotting career in retail management and buying. What was it that appealed about Saint Lucia? Everything from the floral scent of the air when we landed, to the giant ferns along the Barre De Lisle on that first winding drive from Hewanorra Airport. Seeing the Pitons changed my life and I still get goose bumps when I travel south to Soufriere, especially by boat. The music was right, the beaches were gorgeous, people accepted me and I felt right at home here. Maybe it’s because I’m Irish—we really do have a lot in common with Saint Lucians! How do you like to spend your island time? 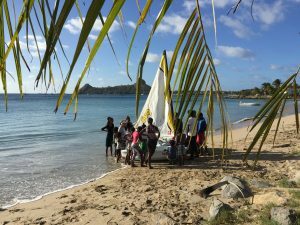 My favourite place to hang out is on the beach in the fishing village of Gros Islet, where we’re trying to involve the local kids in the national youth sailing program. I never miss a chance to take to the sea and as a tourism writer, I often get the awesome perk of reviewing the island’s best boat tours. I don’t own a car, so walking is part of my fitness routine, and when there’s time I go swimming at the tiny beach three minutes from my home. 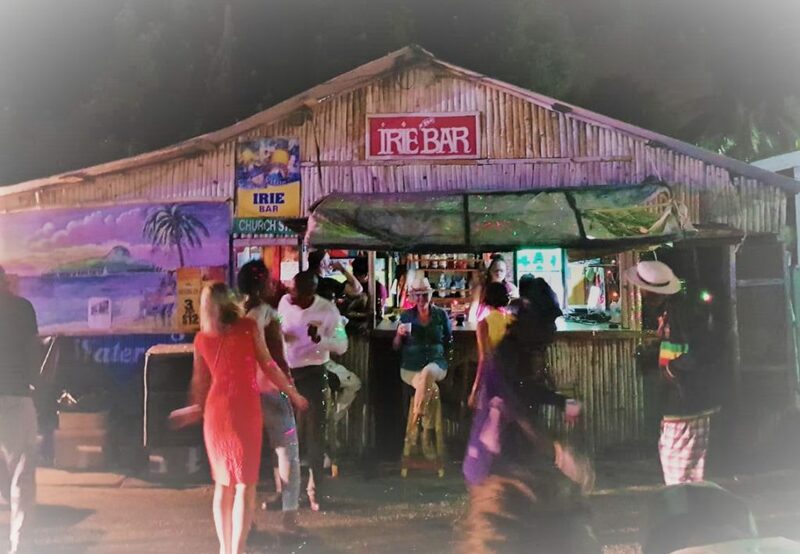 ‘Liming’ is always on the agenda, and I enjoy meeting the eclectic mix of people Saint Lucia offers as a tourist destination. It feeds my curiosity about life. Does living in paradise ever get old? Absolutely not. 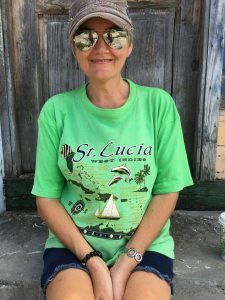 It isn’t that everything is perfect and you have to develop a certain resilience, but for me, the rewards have always come from Saint Lucia, the Helen of the West Indies herself. The only country to be named after one woman and nicknamed after another has given me experiences to be treasured. Living on a ‘Small Island Developing State’ can be challenging for many different reasons, but there is so much natural beauty, so many stories of inspiring people, tropical temperatures, trade winds and sunny weather for which to be grateful. I get to write about it for a living and that’s a real dream come true! But Wordsmith brings to the table twenty-five years of experience in Saint Lucia’s business arena. Working with each client to uncover their dream as well as their company’s business potential, Wordsmith is much more than a marketing agency or PR consultant. We’ve been there, done that, designed and worn the t-shirt. Isn’t it time you had words with Wordsmith Agency?